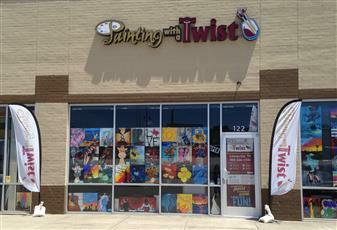 A: Painting with a Twist is a fun art studio for anyone interested in painting! In our classes we use acrylic paints on 16x20 canvases and teach the class step by step through the specific painting of the day. Most of our guests have no painting experience and all of them have great success! A: Your reservation fee includes everything you need to create a beautiful and unique painting! When you arrive you are supplied with an apron, canvas, brushes, paints and step by step art instruction throughout the class! When class is done, your artwork is ready to hang! The only things you may want to bring are some refreshments. Q: Is there a minimum amount of painters required for you to have the class? A: Yes, there have to be at least 4 painters signed up for a painting for us to have the class. If that minimum is not met, we will notify you and offer a Gift Certificate or class transfer. Q: How do I pay for a class? A: We take cash and all forms of credit cards. 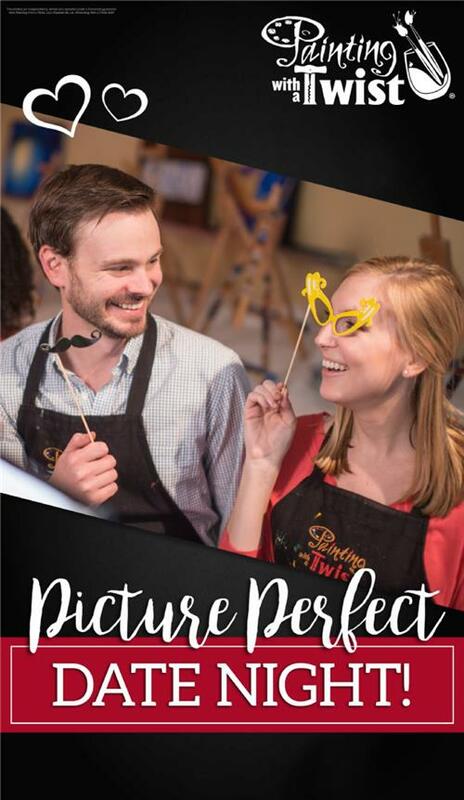 You can pay by phone, the mobile website, on our PWAT Lewisville Website ( https://paintingwithatwist.com/lewisville/calendar/ ), or in the studio. Please note, we will not save your seat/s without payment up front. We do not take checks. A: We are now doing "Public" OFFSITE events at local establishments. The prices for our paintings will not change, but the venue may offer food/beverage specials for your attendance. A: The calendar is posted on the 1st of every month. Q: Does the posted calendar every change? Q: Do posted classes get cancelled? A: YES! If we have not met the 4 person minimum for our classes, we may elect to cancel the class and provide anyone with reservations other options. If the class has no reservations, we may cancel the class or change the art work or class times. We reserve the right to change Art Work and Class times at our discretion. A: Whatever is comfortable and you don't mind if a little paint gets on it. We will have old aprons for you if you need them. A: A reservation is the only way to guarantee your seat. However; we do take "Walk-ins" if their is available seating. A: Our standard canvas is 16 x 20 inch, but we now have 12x12, 10x30, Wood Pallet and Screen Art, watch our website for NEW painting surfaces and options. Q: Are children allowed and is there an age limit? A: Some of our painting classes are for adults 18 or older. However, 12-17 year olds may attend MOST open classes. We occasionally offer family friendly painting classes for children 8 and up. These classes will be marked Family Days or Fun for the Family on our Calendar. For Kids Parties ages are 8-11. (See individual event descriptions for more details) Children not painting, such as babies and toddlers, may not attend any class. unless you have paid for a PRIVATE PARTY. Anyone in the studio during a Public or VIP painting must pay for a seat to stay in the studio during class. A: Our studio is all BYO - we only serve paint water! Feel free to bring in your favorite beverage and some light snacks to enjoy during class! Remember you are painting most of the time so finger foods are best! Also note that it is the law that you have to be 21 years old to consume alcoholic beverages. A: Individuals: Individual credit/debit card refunds may be given with at least 48 hours advance notice, but will be assessed a 15% processing fee. We do not refund cash. Individuals canceling with at least 24 hours notice will be given a refund for the full amount in STUDIO COMP ONLY with an expiration date of 60 days. We require 24 hours notice of cancellation so that we may offer your spot to another customer, any cancellations with less than 24 hours will not receive a refund or store credit. (We require an email request for any Cancellations or Reschedule request, Please reply to your initial confirmation with your requests. Phone calls are appreciated but do not serve as your cancellation.) No shows will not receive a store credit. Paint Your Pet and Specialty Classes: For Paint Your Pet Classes or other specialty public classes, we require at least 7 days notice of individuals cancelling their reservation to receive a refund; Individual credit/debit card refunds may be given with at least 7 days advance notice, but will be assessed a 15% processing fee. We do not refund cash. Anything less than 7 days will result in a Class Move and you may be given the opportunity to transfer to the next Paint Your Pet class. NO Store Credit or Refund will be given for less than 48 hours notice, since we have already used studio supplies and Artist time for you event. (Please leave a message if calling after hours.) No shows will not receive a store credit or class transfer offer. For any other reasons not specified, we do not give credit credit or cash refunds; any and all other refunds given will be in the form of a gift certificate or a class transfer. Gift certificate can be transferred to another person with an email request. Private Parties/Kids Parties: If you cancel a private party, you must cancel at least 10 days prior to the event or forfeit your entire down payment or amount paid; whichever is greater. All cancellation refunds will be given in the form of a Party Move Date for your entire party or a Studio COMP Gift Certificate with a 60 day expiration. We do not refund cash or credit for Private Parties. Bad Weather: Class will cancel if a weather emergency is declared or we determine the roads to be too unsafe to travel on, otherwise our cancellation policy is as stated above. In the rare case of a class cancelling due to poor weather conditions, studio credit will be issued to all registered guests, or you will be offered to transfer to another class. Please see our website for updates in a case of questionable weather. Painting with a Twist reserves the right to cancel classes for unforeseen circumstances. Registrants will be notified at least 24 hours prior to class time, if possible, and refunds will be processed in the form of Gift Certificates or we can transfer you to another class.